The fall semester has ended at Al-Quds University. Last week, I administered the American Politics final exam, and I read and graded research papers. The students felt a lot of pressure in these final weeks, with the heavy demands of end-of-semester work competing with their professional and family responsibilities. But they are now enjoying a month-long break before the second semester begins in mid-January. In the meantime, a special project and the end of semester flexibility gave me a chance to take a tour of the facilities of the University in the Old City of Jerusalem. The institution takes great pride in its strong connections in the heart of the city. To take an explanatory step back for a moment . . . Al-Quds University is, quite literally, “Jerusalem University,” so its symbolic and practical importance to the Palestinian community is immense. The university is among the the foremost Palestinian educational and cultural institutions in the city that Palestinians consider their capital. The university’s main campus (and the place where I teach) is in the town of Abu Dis, which borders Jerusalem to the east (just behind the Mount of Olives). Indeed, many Palestinians consider Abu Dis to be, in effect, a part of Jerusalem itself, though it is now officially part of the West Bank, and separated from Jerusalem proper by a high concrete wall. The Abu Dis campus serves principally Palestinian students who live in the West Bank . . young people who cannot enter Jerusalem or Israel without a special permit granted by the Israeli authorities. Another important AQU campus is Hind al-Husseini College, located in the heart of East Jerusalem near the American Colony Hotel. This college for women was founded by and named for a famous Jerusalemite advocate for women and children. It offers programs in education and related fields, and its current dean is my friend and longtime AQU colleague, Dr. Khuloud Khayyat Dajani, a medical doctor who among other achievements founded AQU’s well-regarded Child Study Institute. And then AQU maintains a number of facilities within the Old City of Jerusalem itself. 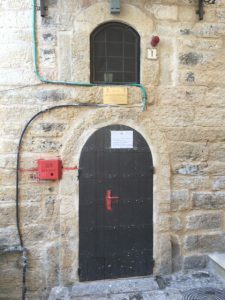 My tour this week was led by Omar Zaro, the business manager of the University’s Jerusalem operations, who himself grew up in an Old City home right on the Via Dolorosa. We started just inside Damascus Gate, where Al-Quds University recently established (in March 2015) the first Palestinian public library to be functioning inside the Old City since 1967. Tucked away on a side street, the library is operated by the University for the benefit of the whole community. The Kingdom of Bahrain helped pay for the renovation, and the result is charming and inspiring. There are several study spaces with natural light and computer terminals. Space is tight, so the thousands of books available (many of them focused on the city of Jerusalem itself) are stored in compactable shelving units. And the University is trying to make its mark on the community – by hosting, for example, a conference on the function of libraries themselves in the broader life of the city. 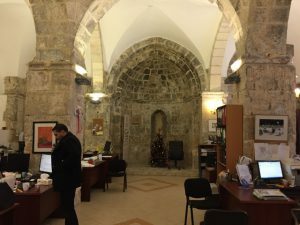 Further into the Muslim Quarter, we came to the University’s Community Action Center, housed in an arched structure originally built as a Crusader church in the 12th century. Here, under the leadership of Dr. Munir Nusseibah, a human rights lawyer, AQU makes its mark serving and advocating for residents of Jerusalem, and particularly of the Old City. The Center, in its words, “aims to empower the disadvantaged of East Jerusalem to access their rights and entitlements and negotiate the complex bureaucratic procedures that control the flow of these rights. This mandate translates into empowering local residents to organize to solve collective problems with particular attention to social and economic inequality, and to mobilize their own volunteer capacity.” The CAC is also focused on what it considers a systematic and ongoing effort by the Israeli government to displace and remove Palestinians from Jerusalem. It also provides direct services to residents of the neighborhood, with a strong focus on the empowerment of women. 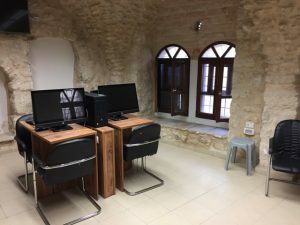 The Center for Jerusalem Studies, housed in temporary quarters near the Lion’s Gate, offers a variety of programs, including an M.A. in Jerusalem Studies, Arabic language classes, and tours of the Old City and other places from a Palestinian perspective. 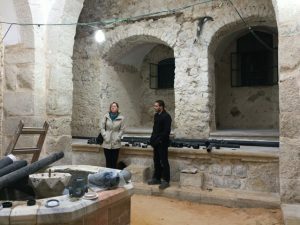 The Center will be moving back in some months to its original location, the site of a Mamluk-era hammam (Turkish bath) which is currently being renovated. We traipsed through the hammam construction site. If all goes according to plan, a year from now it will be a working site, staffed by Al-Quds University students, and run as a small business in the heart of the Old City. The project, however, has been slowed considerably by the bureaucracy of archaeology and renovation in the Old City. The site is above and near to the controversial Western Wall tunnel, which extends from the Wall itself several hundred yards, running beneath the Muslim Quarter; this has complicated the construction process in this extraordinary sensitive area. Finally, we went by Omar Zaro’s childhood home, met his father, who runs a coffee shop right downstairs, and enjoyed Arabic coffee and pomegranate juice. Al-Quds University would very much like to continue to expand and develop its Jerusalem operations, including bringing more students from outside of the region to study there. But it’s complicated. The Israeli government has tended to view the AQU’s activities as a Palestinian attempt to stake a kind of claim to their presence in the city. As a result, Israel has often resisted the university’s efforts to support Palestinian residents of Jerusalem. For many years, the relevant Israeli ministries refused to recognize any AQU degrees, meaning that graduates of the university in most fields were not eligible for employment opportunities within Israeli. Recently, Israel has granted recognition to AQU degrees in medicine and other medical fields, which means that those Arab citizens of Israel and Jerusalem residents who study in the medical complex in Abu Dis are now eligible for employment in the medical arena within Israel. But the vast majority of AQU graduates – including virtually all of those who are studying in the Jerusalem campuses – are receiving degrees that are of little practical use to them if they wish to work within Israel. In the meantime, things will be slowing down now for the next ten days, as the University observes the holidays and its semester break. My best to all for a happy holiday season and start to 2017. My American Politics class had its last session a few days ago. We’re paying close attention to the tweets of President-Elect Trump – interesting in and of themselves, but also useful as a gateway to larger issues in American politics and society. Last week we spent some time on his proclamation that Americans who burn the U.S. flag should potentially be stripped of their citizenship or thrown into jail for a year. This gave us a chance to talk about the complexities of the First Amendment, and to look at the relevant Supreme Court cases that have, by and large, categorized flag-burning as protected speech. It also made for an interesting comparative discussion. My students told me that Palestinian law has some significant restrictions on speech denigrating religious ideas and symbols, but few formal restrictions on political speech as such. Something to learn more about. This weekend, my students are finishing up a paper for their Research Methods class, and they’ll start in earnest their preparations for next week’s American Politics final. I conducted review sessions this week in Bethlehem and Ramallah. They are all feeling a bit overwhelmed, between work, family, and student responsibilities. The multiplicity of commitments – and the particular challenges of studying in a second language – are wearing some of them down. But they are keeping their heads up and looking forward, I’m sure, to a breather in a couple of weeks. I attended a few sessions earlier this week of a conference hosted by the University on “The Production of Inequality” in the city of Jerusalem. A great deal of attention was given to the displacement of the Palestinian population within the Old City and other Jerusalem neighborhoods, with connections made to the continuing expansion of Israeli settlements throughout the West Bank. The shrinking space which Palestinians can call their own is very much on people’s minds here. In the wake of the U.S. elections, a number of Israeli ministers – notably Education Minister Naftali Bennett — have amplified calls for outright annexation of the West Bank. Events on the ground and rhetoric on the airwaves have reinforced the conviction among some Palestinian scholars that Israeli society’s ultimate goal is the removal of the Palestinian people – one way or another – from its midst. This bleak interpretation leads quite naturally to dispiriting conclusions about the future of the region. On a more positive note, I am enjoying hosting my colleague Dr. Sue Lanser at the University this week. Sue is advising AQU during this academic year on improvements the University’s English language requirement. We have had productive conversations together with faculty members, administrators, and outside organizations. It is clear that motivation is high on campus to give students a stronger foundation in this area – which is vital to their continuing studies and to their longer-term career prospects. And also . . . The end of semester and the holiday season bring some sparks of joy to the Al-Quds University campus. 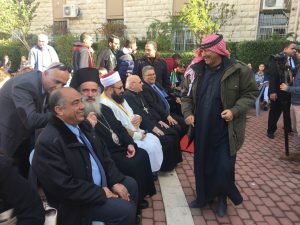 A highlight this week was the inter-faith Christmas celebration in the University’s central courtyard, organized by some active Christian students, and attended by the patriarch of the Orthodox Church in Jerusalem, as well as a prominent Muslim sheikh. 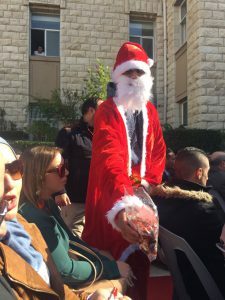 The event included a rousing performance of holiday music by a bagpipe band, a speech on the blessings of peace and mutual understanding by university president Dr. Imad Abu Kishek, and a very slim Santa Claus dispensing candy to all. 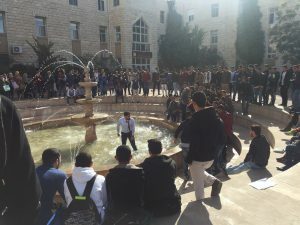 Student celebrations this week also included a ritual bath in the fountain in the center of campus – apparently celebrating the completion of an academic achievement. Under challenging circumstances, the spirit and values of Al-Quds University make themselves felt. In the Palestinian community, the talk here this week is about the seventh conference of the Fatah party, happening this week with 1300+ delegates from the West Bank, Gaza, and around the world in attendance. Many issues are at stake: a succession plan for the inevitable day when Mahmoud Abbas (Abu Mazen) is no longer in power; the prospect of yet another attempt for Fatah to reconcile with Hamas (which Abu Mazen raised again in his 2.5 hour speech yesterday); attempts to heal divides within Fatah itself; the Palestinian circumstances in a world where the Trump administration begins to show its hand; and the question of the viability of the two-state solution at a time of continued expansion of Israeli settlements. The most significant outcome of the event will be the election of a new 23-person Central Committee. 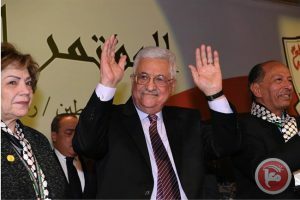 That vote is slated to take place on Saturday, and it will give an indication of how successfully Abu Mazen has shored up his own rather fragile position in the Palestinian political world. It’s very hard for an outsider to peer into this intricate world of intrigue and alliances. For the last week, I’ve been hearing talk of deals being struck and campaigns being waged, and I’ve seen animated groups of men huddled in Ramallah restaurants, but I have no penetrating insights into what is happening inside the conference and why. It remains true that outside the new hall in the Muqata’a where the conference is taking place there remains a great deal of cynicism and skepticism about Palestinian politics and leadership. Abu Mazen is under attack on a number of different grounds. On the one hand, he is said to be weak and too friendly to the Israelis; he was criticized roundly for attending the funeral of Shimon Peres, and he was even taken to task for providing assistance to Israel in fighting the devastating fires that whipped through the region this week. (For his troubles, Abbas was termed the “number one enemy of Israel” by one Israeli minister today.) On the other hand, he is seen as increasingly dictatorial, acting impulsively and extra-legally to jail opponents. His most generous critics see him as a tragic figure, a man with the near-impossible task of succeeding Yasser Arafat, who came to power making a promise to achieve a lasting peace, and who has been unable to deliver on that promise. My students in the American Studies program are not, as far as I know, particularly active in any party politics. They do not seem to have a great deal of faith in the political system within Palestine, and they seem bent on trying to achieve change within their community through structures outside of politics, like business or the media. Even after this election season they are still comparing their own internal politics unfavorably to the U.S. system! I will be curious to hear from them at the end of the week what they think has come out of this conference. Meanwhile, the winding down of the semester and a bit of travel have given me time to read large swaths of two important new books that I am happy to recommend. The first is the new book by Sari Nusseibeh, my friend and the former president of Al-Quds University. 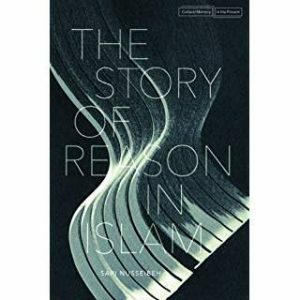 After writing a number of important books on Palestinian politics and society, including his own striking autobiography (Once Upon a Country), Nusseibeh has returned to his intellectual roots as a philosopher to tell The Story of Reason in Islam (Stanford University Press). The book is an enthusiastic and accessible account of the strong tradition of Islamic thinkers who believed that human beings themselves had much to contribute to the discovery and understanding of truth and the moral life. These thinkers, as Nusseibeh describes them, tilted from the very beginning of Islam against more orthodox thinkers who believed taught that the sole source of truth and enlightenment was the holy scripture, the Qu’ran, and that reliance on human reason could amount to heresy. This is wholly unfamiliar territory to me – but Nusseibeh draws the amateur reader in. His first full chapter is a thrilling description of the place of poetry in the Arab world, and in which he argues that humankind’s imaginative response to the dramatic desert landscape was itself a fundamental source of the place of “reason” in Arab thought. Later, his account mixes complex discussions of such matters as “the language-logic debate” with insightful biographical treatments of some of the important thinkers. The book traces carefully the attempts of scholars to reconcile modes of thought that sprung organically from Arab tradition (and, most importantly, from the glories of the Arabic language itself) and approaches to the world that were imported from Greek, Roman, and Christian traditions. While Nusseibeh stays faithful to his focus on intellectual history, he makes occasional forays into the present to suggest the important consequences of these debates for modern Islam, where the tradition of reason sometimes faces an uphill battle against various forms of fundamentalism. I’m grateful to Sari for introducing me to a whole world of thought that I might otherwise never have traversed. 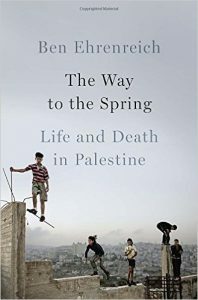 I also recently finished Ben Ehrenreich’s The Way to the Spring: Life and Death in Palestine (Penguin). Ehrenreich, an American journalist, spent several years living on and off in the West Bank, talking with and writing about men and women on the front lines of Palestinian resistance. Much of this earnest and readable book takes place in the village of Nabi Saleh, north of Ramallah, which became a flashpoint for local resistance after residents of the adjacent Israeli settlement of Halamish appropriated for their own use a natural spring that had once been a shared resource for the local Palestinian community. The weekly demonstrations at Nabi Saleh eventually garnered national and international attention. Ehrenreich creates vivid portraits of several families involved deeply in local activism. His book describes both the humiliating and dangerous circumstances of these villagers’ lives under occupation, and also their creativity and resilience in the face of their difficult circumstances. Ehrenreich also spends some time in other parts of the West Bank – notably the southern city of Hebron, where the close proximity of Palestinian and Israeli residents creates extraordinary daily pressure. Ehrenreich’s book is frankly partisan, siding with the men, women and children on the front lines – fiercely critical of both the Israeli occupation and of Palestinians in power (especially in Ramallah) who in his view have lost touch with the spirit of resistance. I found it a little hard to keep track of the many people whom Ehrenreich describes (even with the helpful list of individuals), but Ehrenreich’s engaging first-person style pulled me along from chapter to chapter. As someone spending most of my time in the West Bank in an institution (the university) away from village life, I found this book a helpful complement to my own experiences and impressions. This year, I am happy that two of my four grown sons are able spend the American holiday of Thanksgiving with me and their mother. I am fortunate. My boys have grown to manhood and are taking their place as healthy, productive, active citizens of their country and the world. This year, I am acutely aware that not all parents of sons can enjoy this blessing. My boys were shielded from these particular daily tribulations, and for that I am grateful. But I am also aware on this Thanksgiving Day that other people are paying a steep price for the measure of protection and security that many of us enjoy. Some of that price is paid by men and women who serve in the military or law enforcement. My sons and I owe a debt of gratitude to those who, unlike us, have served their country and their communities in this particular way. But much of the cost of “security” is borne by young men in marginalized communities who are at the receiving end of the excesses of militarized states, and who pay with years of joblessness, incarceration, and lost years of their lives. The prospects for those young men may be growing worse in the coming era, if our governments rely on racist innuendo to justify further repressive measures in the name of combatting crime or terror. So I am also aware, on this Thanksgiving day, that with gratitude comes responsibility: the urgent need to face honestly the massive inequalities that beset our societies, and not simply to take refuge behind the structures of privilege. In a small way, I hope that I am contributing this year by helping young Palestinians understand their own situation in relation to the promises and the perils of life in the United States. It will, however, require more than mere understanding to disperse that shadow of fear. It was Election Night in America when I stumbled into the Mahmoud Darwish Room at the Grand Park Hotel in Ramallah a few minutes after 6:00 a.m. on Wednesday November 9. The room, named for Palestine’s most celebrated poet, was brightly festooned in red, white and blue bunting, and men and women in business attire were already clustered around large screens on the walls. 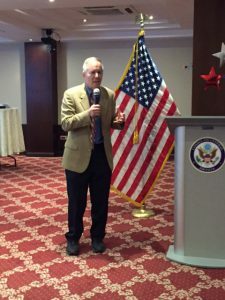 The occasion was a post-election breakfast, sponsored by the U.S. Consulate in Jerusalem in cooperation with the Palestinian Chamber of Commerce, with Consul General Donald Blome as the host. Visiting State Department officials from Washington D.C. chatted with Ramallah businessmen. West Bank Fulbright fellows had scored invitations . . . and the Consulate had kindly allowed me to put my 17 Al-Quds University graduate students in American Studies on the list as well. It was the least I could do – to introduce them by proxy to an American ritual. And show up they did, doing the program proud with their enthusiasm and their growing knowledge about U.S. affairs and institutions. The Consulate had asked me and my colleague Dan Kryder to speak for a few minutes as U.S. experts . . .but as the hour for my talk approached I found myself unnerved. The chatter on the televisions when I arrived in the Darwish room was about “razor-thin” margins and the prospect of a “long night.” By the time Chris Hodges from the consulate was getting ready to introduce me, however, it was shortly after midnight (U.S. Eastern time), and I was coming swiftly to the realization that the “razor” was cutting Clinton more deeply than Trump. I walked around the room in a bit of a daze, trying to assimilate the sea-change that seemed to be coming. I was going to have to talk in real time to 100 or so diplomats, businesspeople, students, and scholars about the emerging developments. I was contending with my own flailing emotions, in a situation that didn’t fully allow for them. The Consulate’s party, after all, was a non-partisan affair. The State Department personnel in attendance were strictly prohibited by penalty of law from expressing their political opinions. While I was not myself in any formal way bound by the Hatch Act, it would have violated the spirit of the event to take sides. In any case, my students were in attendance, and my own style as a teacher has always been to keep my own political opinions more or less off the table in the classroom and in student company. Somehow I got through it. I said something that I basically believe – that the democratic institutions of the United States are strong, and that they have overcome bitter partisan divides (and incompetent presidents) in the past. (It is true, however, that in one tragic case it took a four-year Civil War to settle the issues.) I also tried to convey to the West Bank audience the diversity of the American population . . and something about the “dislocation” felt by so many white people in small towns and rural communities. I drew for inspiration on my own visits to and conversations with my close friend Michael Tierney in Harts Country, West Virginia, on my recent reading of Larissa MacFarquhar’s powerful reporting from nearby Logan County in the New Yorker last month, and also on George Packer’s masterful book The Unwinding. I did my best to conceal my inner turbulence – dwelling on the long view rather than what the unfolding results were saying about us as a nation. I spoke in something of a haze, and I’m not sure how I concluded or whether I came across as muddled or vaguely coherent. Spending the next 90 minutes with my students, however, was cheering. They were sensitive to the historical consequences,. . but they were also removed enough just to enjoy the occasion: sampling the plentiful buffet; donning the red, white, and blue hats and foam Statue of Liberty crowns that the Consulate had provided for photo ops; basking in the attention of senior officials from Washington D.C. Their pleasure in the moment was a welcome distraction. Some of my students – especially those who have spent time in the U.S. or who work closely with American institutions – were profoundly repelled by the idea of a Trump presidency. They have a passionate but not uncritical respect for American ideals, and they found the prospect of a U.S. president who has so openly flaunted his prejudices deeply disturbing. Leadership by insult, they felt, was common enough around the world, but it astonished them (even beforehand) that half of the U.S. electorate believed that Mr. Trump would make the better president. When it comes to the situation of the Palestinian people, there was little difference between Clinton and Trump. U.S. policy has been to “stand with Israel,” and neither of the major-party candidates are likely to break with that tradition. Sure, leaders in both parties have sometimes made noise about the two-state solution, and have tried to broker deals. But these efforts come to nothing, because in the end the American government has never shown a willingness to put any real pressure on the Israeli government to find a solution. The Americans make some public statements about restraining the growth of settlements, but when the Israeli government ignores them, there are no consequences. The Democrats – Clinton among them – have contributed more rhetoric about justice for the Palestinian people, but in the end the left has not created any real action. Clinton or Trump, Democrat or Republican – no change is likely. Sure, Trump may clamp down on visas for Arab visitors, and Muslims in America may face some discrimination . . .but the American government’s position towards Palestine is unlikely to be fundamentally different than it has been before. That, as I say is a summary of the most commonly-held position that I have heard: Clinton or Trump, it made no difference. But a number of people I spoke with this week went further: they argued, in different ways, that a President Donald Trump might very well be better for the Palestinians than a President Hillary Clinton would have been. One smart lawyer told me that Trump’s frank antipathy towards Muslims and his smarmy coziness with Bibi Netanyahu was actually refreshing and helpful to the Palestinian cause. These attitudes, he suggested, were deeply ingrained in American politics and society. But the Democrats have generally been better about masking them. Democrats adopt lots of high-flown rhetoric, and John Kerry earned thousands of frequent-flier miles. But in the end the Democrats tend to be in lockstep with their Jewish supporters – no less than their Republican counterparts. A Trump administration, this Palestinian professional argued, will have no scruples about putting its cards on the table. It may well encourage Israel to speed up the process of settlements – and even to consider annexation of the West Bank. The frank and open expression of this point-of-view from the American side will help people around the world – and Palestinians themselves – understand just where the U.S. really stands. This will in turn help mobilize resistance in the Palestinian community and rally external support. This is a variation on the point-of-view that once had a following among African American civil rights workers – that it was actually better for the movement when unabashed racists were in charge of governments, rather than spineless liberals. A seasoned Palestinian diplomat advanced a different argument to me. Trump, he told me, will be a truly terrible American president when it comes to foreign policy. He knows little about diplomacy, and he disdains alliances. His idea that everything is a win/lose “deal” will cost the U.S. dearly on the international scene. As a result, under a Trump presidency the U.S. will grow weaker as a global power, losing its power and prestige. Rather than a unipolar world order, we will at last have a genuinely multi-polar world order, where the U.S. will grudgingly have to share the stage with China and Russia. (Perhaps two years ago he would also have mentioned the European Union as well, but now . . . ) The Palestinians will benefit from a multi-polar world, because a weaker U.S. will not be able to back Israel as successfully. China, for example, may also play a part in backing the Palestinian cause (for its own self-interested reasons, naturally). Trump’s deficiencies just might pay off for Palestine. A businessman I spoke to had a third theory: that Trump’s unpredictability and independence meant that he might be able to do things for Palestine that Clinton – with all of her political baggage – could never achieve. Sure Trump enjoyed the support of Jewish billionaire Sheldon Adelson . . .but no one could really think that Trump was actually “beholden” to Adelson in any serious way. Billionaires don’t “owe” anything to one another. Trump owes no one anything, he has no entrenched positions on the Middle East, and he likes “deals.” It’s worth waiting and seeing whether he just might be the one who could actually take the unorthodox position of putting pressure on Israel to end the occupation –for whatever mysterious reasons may move him. These are not positions of extremists. They are all from people who are not only “moderates” in Palestinian political opinion, but who have actively worked with Israelis on the political and economic fronts. Still, for all of them, ending the occupation is the overriding concern. However odious Mr. Trump might be as a person, that’s the Americans’ problem. They are looking at the prospect of his leadership from a frankly self-interested Palestinian point-of-view. It is hard to blame them. After 49 years of occupation, it’s easy to understand why Palestinians feel that they do not have the luxury of looking at the broader landscape. Their lives are hemmed in by checkpoints, restrictions on their travel, a hobbled economy, and little access to justice or the rule of law. Trump offers them, too, a prospect of “change” that the U.S. “establishment” has not provided. His sexism and racism are beside the point. Even the likely consequence that obtaining a visa to the U.S. will be harder and harder for Arab visitors and students pales in comparison to any chance to alter the local politics. The United States has been exposed for what it really IS: a nation with deep divisions, deep anger, and a firm commitment to its own self-interest. High-minded politicians (and scholars!) disguise American self-absorption well, but it’s an underlying fundamental truth. If the Trump revolution unmasks some of the hypocrisies of American liberals . . well that’s not altogether a bad thing. By and large I have just been listening. This is a humbling moment in many ways, and my own opinions are perhaps not so important. I do, however, worry that my Palestinian friends and colleagues are underestimating the dangers of unpredictability and instability. Things are very bad in the Middle East – notably just miles away in Syria. But if the United States becomes a flagrantly irresponsible actor in the region and around the world, things could get worse, the conflicts even wider. It has happened before. And when things get worse, the powerless suffer. Some of my Palestinian friends may think that they have nothing more to lose, but I worry that in this they are wrong. I don’t want to overdo this pessimism – either among my Palestinian colleagues or in my own reaction. As I have said in earlier posts, my students and many others whom I know here are not fatalists. They detest the occupation, but they also embrace the responsibility that they as Palestinians have to make changes within their own society – to whatever extent that they can. They are not sitting around waiting for the Americans to make a dramatic move, nor are they wallowing in self-pity. They are instead thinking about how to improve their own institutions, while at the same time seeking some stability and growth in their own personal situations. If they are just a little cavalier about this American moment, I cannot hold it against them. We Americans can’t expect much sympathy for our plight! This week, I am embroiled in a new teaching experience – “Research Methods and Analysis,” which complements the “American Politics” course that has been absorbing me so far. My Brandeis University colleague Dan Kryder has come to town (taking two weeks off from HIS Fulbright at the British Library) for an intensive two-week stint. We are offering the course to the first-year M.A. students in American Studies and European Studies. Dan is the instructor of record, but I told him that I would make myself available to help in whatever way I could to enrich the content of the course, so I am assisting. For the students, the class meets three hours per day, five days/week, for two weeks. This is a challenge for many of them, because they are juggling work and family responsibilities, in addition to the M.A. program. Traveling from location to location within the West Bank can be a long and tedious process, so daily travel for class is a hardship. So Dan and I decided to accommodate them. Rather than giving the course three hours per day at a single location, we are offering the same sessions twice per day in two locations: the University’s main campus in the village of Abu Dis, and the University’s satellite campus (the Institute for Modern Media) in Ramallah. We’ve got around 16 students in each location. It means six hours per day of teaching, plus a race between Abu Dis and Ramallah to get there in time for the late session. Dan and I have done some dividing of responsibilities – which helps! – but it’s still a fairly grueling schedule. Still, it’s harder on the students: one student in American Studies has a fairly senior job in a Palestinian Authority ministry, travels to Europe for work, and his wife just gave birth to the couple’s fourth child! But somehow he is attending class and turning in his papers. Quite an endeavor. For the class, we’ve asked them each to construct a research question focused on political opposition to immigration – either in Europe or in the United States. Obviously it’s a issue that is very much alive on both sides of the Atlantic, and the focus on Muslims on both continents gives Palestinian students some additional incentive to dig deeply. It’s proving a challenge to balance the mechanical aspects of this (introducing them to the technicalities of the APA style for citations, for example, or warning them about the perils of plagiarism) with the more engaging and substantive aspects of research methods (such as defining a clear research question and conducting a literature review). To their credit, the students are showing up and forging ahead, understanding that these are tools that they need to acquire. Still, I think that the American Studies students will be happy when we can return to the arcana of politics in the United States . . and the new future after November 8! After crowing in my last couple of posts about how quiet the Al-Quds University campus and that no class days have been lost, recent weeks have had their share of disruptions. I showed up at 9:00 a.m.one Sunday morning to an empty parking lot and empty halls. Apparently the union for teachers and staff had called a one-day strike – announced on their Facebook page shortly before midnight on the previous evening. Over the intervening eight hours, the word apparently got around efficiently to faculty, staff and students – to all, apparently, except the clueless visiting scholar. It wasn’t bad, really. I got to have coffee with one faculty member with whom I’d been meaning to connect, and I caught up on my students’ papers. . . and as it happened my own classes didn’t meet that day, so I didn’t lose any class time. But it was a reminder that things can change quickly. I never did get fully to the bottom of the issues behind the strike – it appeared that it was, at least in part, a response to the administration’s plan for increasing the University’s efficiency. But the details were obscure to me. Then there was the first day of the Research Methods class, when about 20 minutes before the end of class the young women nearest the window started covering their mouths and noses with their handkerchiefs. Dan Kryder blazed right ahead, showing himself a faculty leader determined to proceed with the class no matter the obstacles. But maybe it was just that his eyes and throat weren’t quite as sensitive to tear gas. The incident – which apparently involved some back-and-forth with a jeep of Israeli soldiers – took place up the hill, at some distance from our Faculty of Arts classroom. And it was raining, which helped minimize the effects. So the impact wasn’t as great on us down the hill as it might have been. On the plus side, the AQU campus is host to a constant series of overseas visitors, academic and cultural events, and extra-curricular innovations. 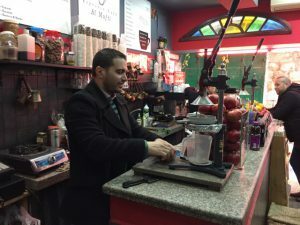 Unfortunately, I missed the opening of the University’s vegan cafeteria – a first for Palestine – which they opened in response to student demand. Two American friends — Peter Hilton and Jodi Hilton — came to campus with me today, and their visit reminded me to emphasize just how normal Al-Quds University looks most days of the week. Students proceed with their classes, hang out drinking coffee, and celebrate the completion of mid-term exams. With the weather still comfortable, a lot of campus life is still outside – in the pleasant gardens and cafes that the University has carefully cultivated and expanded over the two decades that I have been involved here. Yes, the high and forbidding Israeli concrete wall that separates Abu Dis from Jerusalem rings the western edge of the campus – a constant reminder of the political climate. But inside, students go about the business of . . .being students. Last week I found a day to head up to the northern West Bank city of Nablus to visit two friends there. Mohammed Sawalha is a longtime friend – a professor of English language at an-Najah University who also runs an innovative NGO called the Palestinian House of Friendship. Mahmoud Suleiman is a newer friend – the other Fulbright Scholar in the West Bank in 2016-17. Mahmoud teaches education in Bakersfield, California. As it happens, he grew up outside of Nablus in A-Sira, the same village as Mohammed . .. and they are even related. 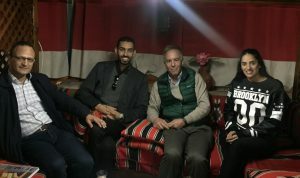 But my visit provided the first occasion for the two of them to get together since Mahmoud arrived in Nablus in August. It was interesting to spend the day on a different Palestinian campus. An-Najah is the largest of the Palestinian universities, with 23,000 students or so, scattered across an old campus and a new campus with dramatic views of the city’s valley setting. While there, I had a chance to listen in as a few students (many of them from the engineering faculty) practiced for an English-language debate competition. 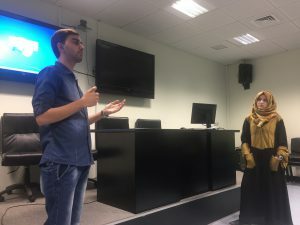 Two students from An-Najah University practice for their debate. The question was: Should Palestinians who are educated outside of the country have an obligation to return to Palestine, or is it OK if they stay and live abroad? (Well, that’s not the exact wording, but you get the idea.) The students were either terrific actors – or else they really brought deeply-felt and well-reasoned arguments to both sides of this difficult question. They also had the benefit of working with Alia Gilbrecht, a dedicated staff member from the United States. 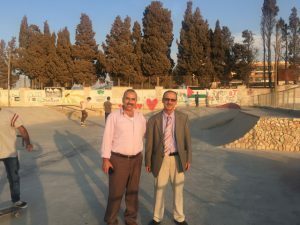 Later in the day, I had the pleasure of visiting the amazing skateboard park that Mohammed and his colleagues at the Palestinian House of Friendship completed in the last year. Set on a beautiful hilltop in the village of A-Sira, it attracts young people from Nablus and the surrounding communities to hone their skills under the tutelage of international volunteers. Mohammed even hopes to see the park be the training ground for a Palestinian skateboard team at the 2020 Olympics. On to Tokyo! 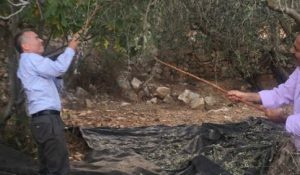 The day in Nablus concluded with a short stint in Mahmoud’s family’s olive groves. It was the heart of olive picking season, so I got my turn to knock some of the small green fruits from the tree, and to drink tea from water boiled over olive wood. 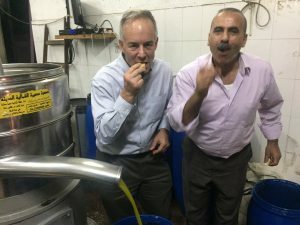 A visit to the A-Sira town press gave me a chance to sample the oil straight from the final stage of filtration! Today, of course, everyone here is focused on what will happen tomorrow in the U.S. presidential election. I was commandeered into service at the last moment this morning to speak in Dr. Mohammad Abu Koash’s political theory class about the Electoral College. I hope that I didn’t confuse them too much! As I think that I’ve said before, many of my students find Trump distasteful . . .but their enthusiasm for Clinton is tempered by their low expectations of her advocacy for the Palestinian cause. But at the very least, they are primed to understand the state-by-state process as the returns come in here early Wednesday morning! Those are my students . . . in the dedicated American Studies classroom on the first floor of the Faculty of Arts at Al-Quds University. The books you see behind them are part of an American Studies library, built up with donations over the 15+ year life of the program under the leadership of Dr. Mohammed Dajani. There are hundreds of books – many of them classics of American political science and literature, and also many textbooks from a variety of disciplines. (Yes, that’s a shelf-full of “Library of America” volumes at the upper left of the photo.) As far as I can tell, the most recent donations came in around 2009 or 2010, so one of my projects for the coming year is to try to update the collection. Suggestions welcome for sources of high-quality book donations in American politics, literature, and other fields. Ten days ago, the infamous tape of Donald Trump bragging about groping and grabbing women was breaking news as my American Studies class was meeting. In deference to my students’ sensibilities, I told them that I was not inclined to show the video as part of our class, though they could easily find it on the internet themselves if they were curious later. But the group – to a person – insisted that I cue it up and let it roll. If this was big news in the U.S. and a vital part of the campaign, then they wanted to see it – despite any vulgarities. Of course I also showed Mr. Trump’s midnight apology-of-sorts (in which he claimed that Bill Clinton had done “far worse”), and we had a robust discussion of the place of sexual innuendo, attitudes, and actions in the course of American campaigns. The students found the tape distasteful, but their outrage in the immediate aftermath was somewhat muted. Part of this, I think, was that it was not actually easy for non-native speakers of English to hear what exactly was being said on the tape – the specific phrases that Americans found so shocking weren’t easy to parse in a single screening. (I declined to show it multiple times!) But for many of these students, the whole sordid mess represents a distraction from the issues that they would rather be talking about. So while some of my students expressed strong criticism of Mr. Trump, many took a “pox on both their houses” attitude. We have been spending a good bit of time on the U.S. Constitution (both its flaws and its glories) in recent weeks – and the contrast between the high-minded debates over the structure of government and what they saw as petty mud-slinging disturbed them greatly. I did try – with modest success – to persuade them that what is at stake are important matters of government and policy. It’s not difficult, in the end, to draw connections between attitudes towards women among political leaders, on the one hand, and the ways that government does or not advance the rights, dignity, and equality of women through its policies. And distasteful though the process has been, the campaign has served to continue in a certain way a national conversation about sexism and racism and their embeddedness in American society. One thoughtful student, mulling all of this over, asked me after class whether Trump may have had a point about Bill Clinton. We had previously discussed – in the context of studying the Presidency — that Clinton was impeached by the House but not removed from office in the aftermath of the Monica Lewinsky scandal. If Trump is unfit for office because of his attitudes towards women, the student wondered, shouldn’t the country have judged Clinton unfit for his actions with Monica Lewinsky and the untruths that he told to the American people about those actions? She understood that the situations were not exactly the same . . .but she also felt like there might be a double standard at work. It was not an easy question to answer. When it came to the second debate, we spent more time on the exchange between the candidates on the issue of Muslims in the U.S. We looked at Trump’s December 2015 call for a ban on Muslims entering the U.S. “until we find out what the hell is going on,” and his refinement of that ban to “extreme vetting” in the September 2016 debate. Many of my students were surprised to learn that Hillary Clinton’s statement that there have been Muslims in the U.S. “since George Washington’s time” was true. But they were also quite quick to pick up on the fact that Clinton actually echoed one of Trump’s points by saying that the United States needed Muslims to be our “eyes and ears” for potential threats to the country. We also looked closely at the Republican and Democratic party platform positions on the question of the conflict between Israelis and Palestinians. To my eyes, there’s quite an enormous difference between them. The Democrats (influenced heavily by Sanders supporters) voiced support for Israel and opposition to BDS, but also explicitly mentioned the two state solution, and legitimate Palestinian aspirations for independence and dignity. The Republican platform calls for “unequivocal support” for Israel, and does not even mention the Palestinian people. My students saw the difference in the rhetoric, but it would be hard to persuade them that the difference in language would make an appreciable difference in policy. In their opinion, “strong support” for Israel, even if qualified with rhetoric about Palestinian rights, is not going to improve the situation; the recent signing of the multi-year military aid deal between the U.S. and Israel was very much on their minds. In general, the academic year at Al-Quds University has continued to proceed smoothly. Unlike in previous years, no class days have been lost yet this academic year to strikes, disturbances, or incursions. Last year the campus experienced numerous clashes between students and patrolling Israeli police and soldiers. There was one incident approximately one week ago on the outskirts of campus, where an altercation broke out between some young Palestinians and Israeli forces, and tear gas cannisters were lobbed into campus. But this incident took place after 4:00 p.m., when most students and faculty (including me) had left the campus. So the impact was minimal, except, perhaps on those injured (a Palestinian news agency gave that number as 52). With many Jewish holidays this month and with the busy-ness of the academic year in full swing, I have not had time in the last couple of weeks to travel around. But I will be holding small group meetings with my students in Bethlehem later this week, and heading to the northern part of the West Bank later in the month to visit another Fulbright Scholar, as well as friends and colleagues in that area. So I will gradually be expanding my horizons as the fall progresses. I have had a chance in recent days to spend some time with some of the alumni of the first year of the Our Generation Speaks (OGS) program, whom I got to know at Brandeis this summer. 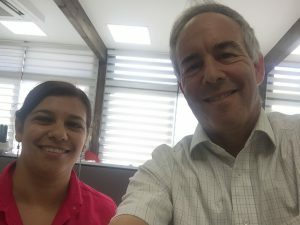 Yesterday, for example, I visited Abeer Al-Natsheh at the new offices of My Pink Electronics, an IT services company in the East Jerusalem neighborhood of Beit Hanina. Abeer has built from scratch a business of women serving women. She employs a cadre of female employees who provide IT services from their homes to female-owned businesses in Jerusalem and the West Bank. Running now at full capacity, Abeer is now exploring options for how to scale up her business – it’s an impressive achievement in a difficult climate. The semester at Al-Quds University (AQU) is now in full swing, so my work is now very much up-and running. After several weeks of intense recruiting, I now have a class of 20 students in the M.A. Program in American Studies. They are mostly in their twenties, young people who are early in their careers. Several are working in the media – in broadcast journalism, newspapers or on social media platforms. Three or four are in business – telecommunications, or accounting, or retail. One (an older student) is a fairly senior government official in the area of vocational education. A few are recent graduates – many of these majored in English language, so they are well-prepared for a mostly-English curriculum. So I am teaching American Politics, in a dedicated American Studies classroom packed with thousands of books that have been donated to the program over the years. That part is fun. The collection is actually quite impressive . .and of high quality . . . though the donation program has been dormant in recent years, so the most recent materials are from around 2009. We squeeze in together around a rectangular table surrounded by books (as well as miscellaneous oddities like years and years of Newsweek magazines from the 1980s). And we talk American politics. I’m dividing the class between a more-or-less traditional U.S. politics curriculum, and intense attention to the 2016 presidential election. We’re immersed in the U.S. Constitution at the moment . . . in our last class, for example, we spent some time talking about the second amendment – its wording, its importance in American culture, its place in the current presidential campaign. I worried at first that they might find the concept of a “well-regulated militia” confusing . . .but of course, here I was completely off-base. They’re well acquainted with the English word “militia” – perhaps better than most Americans – because there are plenty of militia-like organizations in the Palestinian sphere. So we had a lively discussion militias, gun rights, and the role of the gun lobby in U.S. politics – grounded in a brief discussion of the role of militias in the colonies leading up to the American Revolution. Naturally our attention this week was also fixed on the first presidential debate. I hosted a debate-watching party at the U.S. Consulate’s outpost (“America House”) in Ramallah. (No, we didn’t watch it live at 4:00 a.m. local time . . .we caught it on YouTube!) Like many Americans, the students were both entertained and appalled. The most common initial reaction was how little time was spent on pressing issues, and how much devoted to matters of little substantive import like President Obama’s birth certificate or Hillary Clinton’s alleged lack of “stamina.” (A moment that provided an opportunity to expand their English vocabulary!) “The Iraq war, tax returns, bankruptcies, and Obama’s birth certificate; all of these issues were a waste of time,” one student said. But some grasped immediately that the debate was as much an opportunity to consider the character and values of the candidates, rather than their detailed positions . . . and they dived into their analyses in this spirit. All were disappointed that the Middle East merited so little attention – the only reference to the Israeli/Palestinian situation was Trump’s off-hand remark about Netanyahu and the Iran deal. Some of the disappointment about Clinton may reflect the strong “pro-Israel” position that she has been taking this year . . though we did not yet discuss this in the class in depth. Beyond American Studies I’m involved in a variety of other projects at AQU, building on my relationships with many people across the University. Last week, for example, I had the pleasure of helping to host my Brandeis colleague Sue Lanser, who came for five days on a project to help AQU re-consider and redesign its English language requirement. The University recognizes that giving its graduates more command of English is essential to their future employment prospects, so it’s making a big push over the next year. I’ll play a supporting role in efforts like this. On the personal front, it was a pleasure to have Maggie here for the past three weeks. Together we explored Jerusalem, went back-and-forth to Tel Aviv to spend time with my son Theo and his girlfriend Shelly, and headed into Ramallah to visit AQU friends. She has headed back to the US for the time being . . but has promised that she’ll come for longer next time! Today is the celebration of the Muslim new year – AQU (usually open on Sundays) is closed. And meanwhile Jewish Jerusalem and Israel are preparing for Rosh Hashanah, the Jewish new year, which begins at sunset this evening. I’ve been blessed with warm invitations to holiday gatherings from friends and friends of friends. . . so I’m looking forward to celebrating and contemplating the new year with the special kind of intensity that Jerusalem provides. To my friends of all faiths . . .a very happy new year to you and your families, even as we keep our minds and hearts alive to those who are suffering in these turbulent times . . . I am now ten days or so into my stay in Israel and the West Bank as a U.S. Fulbright Scholar for 2016-17. I am in residence at Al-Quds University (AQU) , a Palestinian institution, with which I have been associated for many years. My main job for the year: to teach in and to help develop the university’s M.A. Program in American Studies. The program was founded in 2003; it has been in transition since its founding director left AQU in 2014. Over the past year or so, I have been working with the faculty of the Regional Studies Institute at AQU to re-design the program. Two colleagues from Brandeis University – Sue Lanser and Dan Kryder – have also been participating in a significant way in this effort, along with AQU faculty colleagues Drs. Amneh Badran, Mohammad Abu Koash, and Awad Mansour. 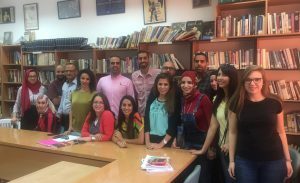 The new curriculum builds on the program’s traditional attention to U.S. history, culture, and politics, but is also intended better to meet the needs of Palestinian professionals through an emphasis on conceptions of leadership and entrepreneurship and a focus on the study of American institutions. The Regional Studies Institute will also, thanks to our work together, become the Global Studies Institute (if the University’s governing authority approves the change this week!). I will be teaching American Politics this fall, as well as working faculty and administration closely on building resources and relationships that will be of long-term benefit to the program. Among other things, the program design calls for many courses to be taught by U.S. faculty in an intensive format. Identifying those faculty and helping to generate the resources and environment to make their stay at AQU as productive as possible is a big part of my job for this year. Of course, it will also be quite interesting to be in a classroom this semester with young Palestinians trying to make sense of American democracy and the election of 2016! In my first ten days, I have been settling in, as well as helping to recruit students for the incoming class. 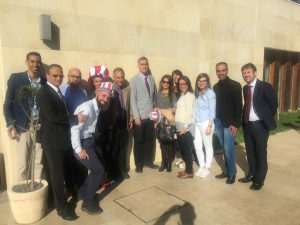 Because the program has been less active in recent years, we are undertaking a process to spread the word among the Palestinian community that the program has a new emphasis, and will also potentially offer students the opportunity to study in the U.S. as part of a customized summer program. We will be conducting interviews of applicants in the coming days, and the semester will start in earnest for this program during September. It also seems that I will be involved in a variety of university-wide initiatives. I have worked closely for many years with Dr. Imad Abu Kishek, AQU’s talented and very active president. Dr. Imad, as he is known, has a lot of plans for expanding AQU’s research capacity, its English language curriculum, and its international profile, and I expect to be involved as part of a team in some of these areas. I am living in Jerusalem, in a small house on a dead-end street owned by an Israeli-born physicist who grew up there and now uses it only in the summers. I am composing this post on a balcony overlooking a verdant and pleasantly overgrown garden that shields me from the small apartment buildings that hover around me. (My house is, as far as I can tell, the only remaining single-family dwelling for blocks in every direction.) My own neighborhood is very quiet, but it’s only a fifteen minute walk to the busy center of town, or, in another direction, 15 minutes to the café life of the German Colony, and only a ten minute walk up the slopes of a valley to the front gate of the Israel Museum. Commuting to the AQU campus is a bit of a schlep. Al-Quds (“The Holy”) is the Arab name for Jerusalem — so to the Palestinians, AQU is Jerusalem University. And AQU does have some operations in East Jerusalem proper. But the main campus is in the village of Abu Dis, in the West Bank. I have a car for the year, but it’s still a bit of a trek. Because the security barrier (a concrete wall in Jerusalem) blocks the direct route, I drive north across the heart of downtown (passing Jaffa Gate and Damascus Gate of the Old City), through the tunnel under Mount Scopus, down towards the Dead Sea, and then loop around by the huge settlement of Ma’ale Adumim. There I pass out of the Israeli security zone and into the Palestinian villages of Al-Azaria and Abu Dis. (Those villages are not exactly Palestinian-controlled either – a subject for another post.) The roads in the villages are crowded and chaotic – but in the mornings, I arrive at the Abu Dis campus in about 30 minutes door-to-door . . traffic isn’t too bad. The afternoons have been a different story. The Israeli army has been setting up temporary checkpoints in Al-Azaria and Abu Dis recently, which can clog up traffic, so it’s sometimes taken more than an hour to return. I have also been spending some time in Ramallah, visiting NGOs and other individuals whom I know there, trying to spread the word in person about the American Studies program. I will doubtless be traveling to other areas of the West Bank in the weeks and months to come, as time and security considerations permit. So far I’m on my own here. My wife Maggie is back in Concord, Massachusetts preparing for the opening of a show of her work at the Arsenal Arts Center in Watertown, MA early in September. She will spend the rest of September here, after the show’s public opening on September 10. But I have the pleasure of being close at hand to my son Theo and his girlfriend Shelly, who live in Tel Aviv . . .and it’s been a pleasure to share the last two Friday evenings with them (one at my place, and one at theirs). As time goes on, I’ll try to be less general and give more textured portraits of the university what I see and do.